Sky Sports' Vinny O'Connor targeted. 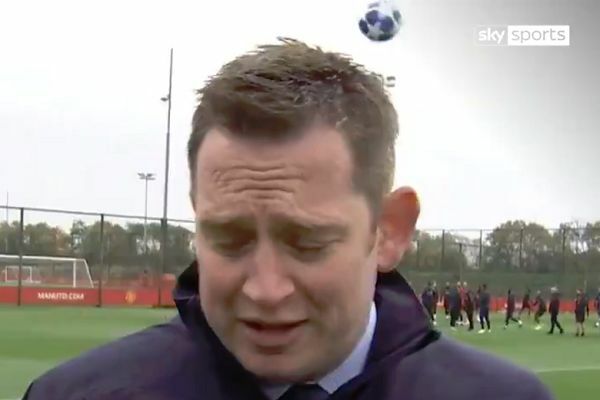 Manchester United’s Marcus Rashford appeared to attempt to hit a Sky Sports reporter with a ball at their training session ahead of a Champions League clash at Juventus on Wednesday. Presenter Vinny O’Connor with the team, standing with his back to the players while speaking to the camera. A ball can suddenly be seen above him, flying towards his head. O’Connor is somehow alerted to its presence and manages to partially move out of the way just in time. Some of the Man Utd squad are shown laughing as the camera zooms in on them.